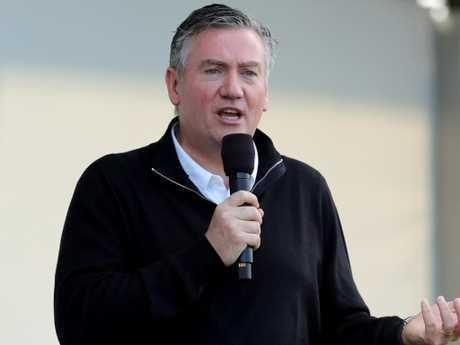 Eddie McGuire has described as untrue the recent claim that 16 players at a single AFL club are avoiding drug tests on mental health grounds. 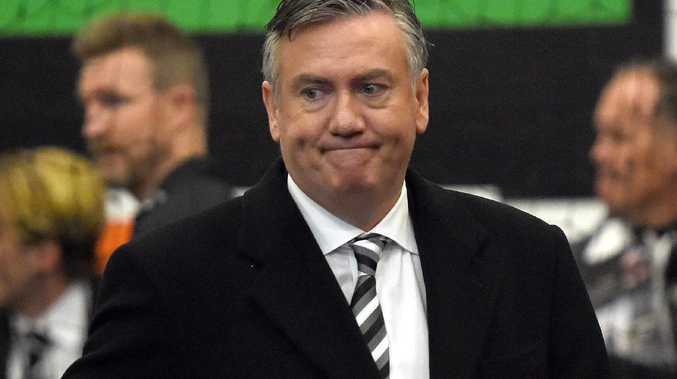 COLLINGWOOD president Eddie McGuire has slammed allegations up to 16 players at an AFL club have been using mental health as an excuse to avoid drug testing. Radio host at 3AW Ross Stephenson claimed 16 players at a single club were avoiding tests on mental health grounds, but McGuire ridiculed that accusation on Friday. "I want to come off right now and say that is not true," McGuire said on his Triple M breakfast radio show this morning. "That is categorically not true. "There's not a team that's got 16, and it's not 14, and it's not 15, and it's not 17 … I'm saying that that's not true. "There's been reporting over the journey that is not true in these situations." McGuire, a veteran of the media industry, admitted while society had a problem with drug use and the AFL wasn't immune to it, the numbers thrown around were not accurate. "I have been a journalist for a long time, I know how to find the stories. I stand by my sources, it's not true," he said. "I'm saying it's not true. "You have to trust me on this situation. I'm telling you let's not get excited about rumours and stick to the facts." Earlier in the week Geelong star and AFL Players Association president Patrick Dangerfield sang a similar tune to McGuire. "I'm not sure where those numbers have come from, but I think they've been plucked out of the sky and I would severely doubt that," Dangerfield said on SEN.
"The system is in place for a reason. It is not there to be exploited, so we've got to continue to communicate that message and I'm really confident the vast majority of players understand that really clearly." McGuire just wants the truth known. The fraught issue of mental health will be a focus as the AFL reviews its controversial illicit drugs policy. The league has confirmed it is reviewing the code, just over three years after changing it from a three-strikes to a two-strikes policy. One of the AFL's thorniest issues is back in the spotlight, with prominent club presidents Jeff Kennett and Peter Gordon renewing their criticism of the policy. Former player Wayne Schwass, a prominent mental health spokesman in the game, also has expressed his concerns about a perceived loophole in the policy, which expires next year. The league said in a statement it was working with the players' association to ensure the code's objectives, including player welfare and accountability, were met. "The ongoing review will include consultation with clubs, players and medical professionals," an AFL spokesman said. Schwass has no doubt that some players have used mental health issues as an excuse to avoid sanction under the illicit drugs code. "We'd be naive to believe there wouldn't be a percentage of players across the competition that have made those decisions - they've taken substances and they've used mental health as an issue," Schwass told SEN.
"I think the intention of the current illicit drug policy is to help those that have legitimate drug issues and drug problems and also legitimate mental health conditions. "I think that the system and the way it's currently being implemented and executed does leave gaps in the system for players to be able to exploit this." 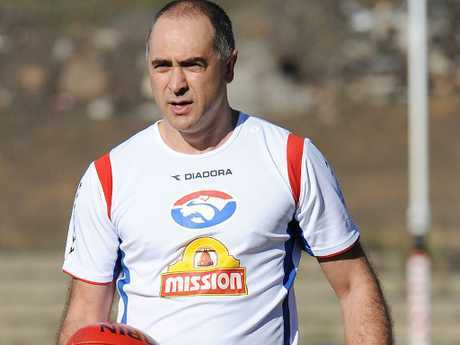 Wayne Schwass has regularly urged the AFL to do more to help players’ mental health. "But if you've got Peter Gordon, Jeff Kennett and Eddie McGuire saying that this is an issue, we have to listen to what they're saying," Schwass said. The league is frustrated by the focus on the mental health issue, with officials adamant it is not a simple rubber stamp for a player trying to exploit the system. Hawthorn's Kennett and the Western Bulldogs' Gordon have been strident in their criticism of the three-strikes policy. The Hawthorn president told 3AW on Thursday that the code was "pointless". However, McGuire was more measured. "The policy is helping more people than would be the situation if there wasn't voluntary testing by the players," the Collingwood president told the Herald Sun. "But if we can get to a position where we are able to look after this inside the club, that would be the best of all positions, but I think that would be an evolutionary position." Schwass said the clubs had a point about wanting more involvement in the policy but any changes that the AFL might decide to make to the policy must have the players' agreement. The players have voluntarily agreed to the policy, which started in 2005 and is separate to the league's standard anti-doping code. No player has been suspended since the policy changed from three strikes to two.